Students from Writing 310, Writing in Professional Contexts, taught by Jeanine Rauch of UM’s Southaven Campus, joined Dr. Jonathan Harrington’s EDHE Career and Life Planning class to learn how to prepare for and conduct themselves professionally at interviews held in restaurant settings. 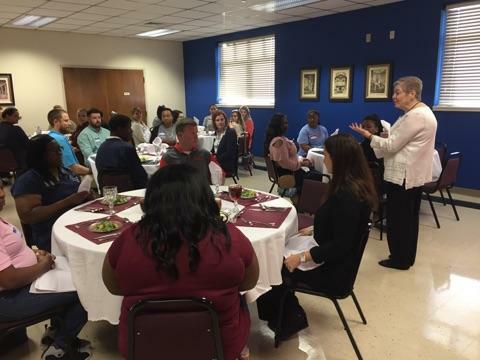 The experience, facilitated by Dr. Janet Cherry of the University of Memphis, was voluntary for the Writing 310 students, who were asked to engage in interview question analysis and prewriting in order to develop answers to commonly asked interview questions. Students were able to practice their solutions in a local restaurant; many commented on how helpful the experience was for them.